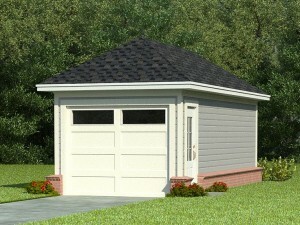 The Garage Plan Shop – What Can a Small or 1-Car Garage Plan Do for You? Have you ever found yourself wishing for or dreaming of a detached garage to protect your car from the elements or store extra stuff? Do you worry about the cost of build a garage or the lack of space in your backyard? If you answered “yes” to one or both of these questions, building a one-car garage plan from The Garage Plan Shop may be the solution you are looking for. Single-car garages are versatile enough to serve a variety of needs and they are generally simple in design making them an economical build. 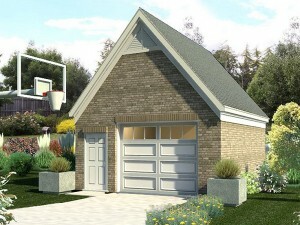 Small and 1-car garage plans are just that, small enough to store one car inside. In most cases, their compact sizes allow them to fit in the most modest of backyards solving the issue of a small space or tiny backyard. Furthermore, most are quite basic in design foregoing all the stylish exterior elements and special features that drive up building costs. Generally, even those with a minimal budget can afford to build a one-car garage plan. Of course a 1-car garage is just right for providing sheltered parking for one automobile, but do you know what else a 1-car garage can do? Take a look at the list below. You might decide that a single-car design is flexible enough to accommodate your parking needs now and convert to another use in the future. Or, maybe you’ll decide you need a 1-car garage for one of ideas mentioned below. So, what can a small garage or 1-car floor plan do for you? Whether you want sheltered parking or a workshop, small garage plans and 1-car garage blueprints can accommodate a broad range of needs. I recently heard a friend talking about the need for a garden shed. He is looking for a large shed that will easily accommodate the riding mower, lawn equipment such as rakes and the leaf blower, and a planting table for his wife. After much research and several stops at many home improvement centers, he has come to the conclusion that there isn’t a shed out there that is large enough to satisfy his needs and offer room for storage. A single-car garage may be the perfect solution. In most cases, a detached garage fits nicely in the corner of the backyard. These designs are available in various widths, depths and styles making it easy to find just the right one to match any home and fit almost any lot. Added bonuses come with a one-car garage that a garden shed cannot offer. The overhead door is perfect for accessing the riding mower and other large items. A service entry is just right for grabbing a small tool quickly. Plus, a one-car garage offers more wall space for storage cabinets, hooks and shelving and usually a taller ceiling height that a garden shed might not deliver. Furthermore, there will be plenty of room for a planting table. 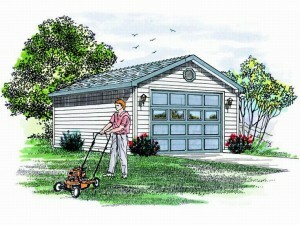 It is easy to understand that a one-car garage may make the ideal garden shed.